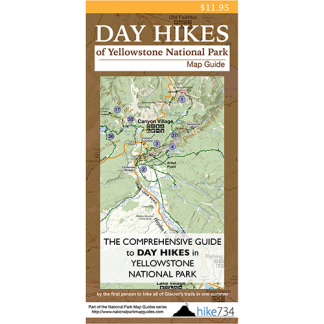 If you’re heading to Glacier, Zion, Yellowstone, or Grand Teton, this site will help you choose the perfect hike to explore through the blogs and shop where you can pick up the day hiking maps that I create. 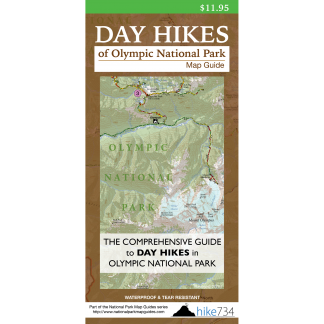 Scroll down and explore through the national parks, the blog, and the shop to get the perfect day hiking maps for your next national park adventure! 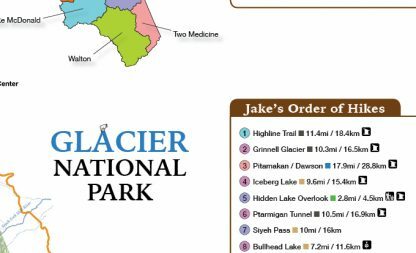 Looking to spend a night or two in Glacier National Park’s backcountry? Get outfitted with the right knowledge to secure a permit, discover your perfect trip, and get general advice on backpacking. 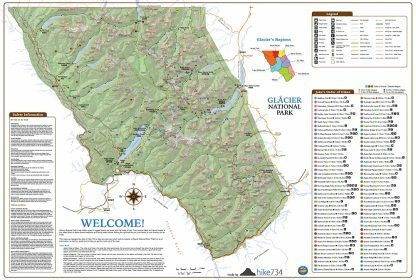 Glacier National Park is a day hiker’s paradise. From flower meadows, to alpine landscapes, there’s plenty to explore. Click below to find the perfect hike to fill up your day. The tall, red walls of Zion National Park beg to be explored. The Virgin River snakes through this canyon where words like “temple” are used. Click below to find the perfect hikes to fill up your day. At the heart of Yellowstone National Park lies a volcano that influences every aspect of this diverse landscape. From Yellowstone Lake to the vast grasslands to the surrounding peaks, there are an abundant array hydrothermal features and wildlife. Trails lace through this wild country waiting for you to explore it. Click below to find the perfect hikes to fill up your day. The sawtooth silhouette of the Tetons in Grand Teton National Park has to be one of the most iconic in all of the National Park System. Trails lace through these mountains and explore the lakes at the foot of them. They continue out into the vast Jackson Hole area. 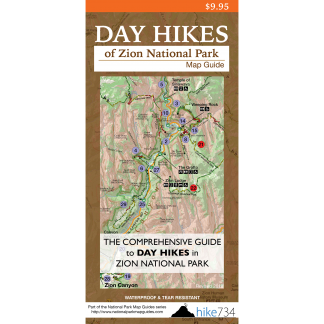 Click below to find the perfect hikes to fill up your day. With legendary names like Half Dome, El Capitan, and John Muir, Yosemite is as iconic as it is beautiful. The granite domes and the enormous waterfalls into breathtaking valleys have lured travelers for years. From the mammoth Giant Sequoias, to the High Sierra, find your perfect walk amongst giant trees, epic waterfalls, and tall granite walls. My wife and I purchased the wall map and framed it for use in Glacier National Park (GNP) trip planning. 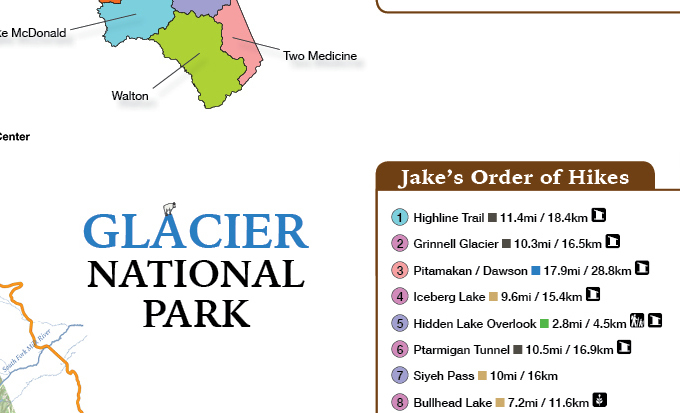 We use the wall map in conjunction with Jake’s Glacier Package and other resources. We are in the process of planning our next trip to GNP and the wall map is a very handy resource. 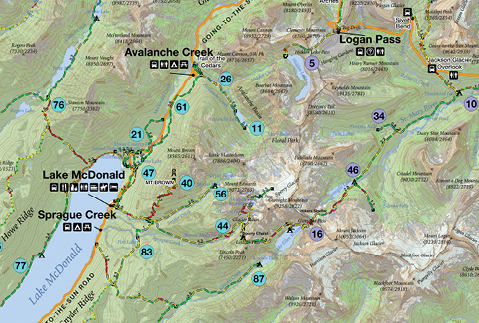 Jake’s map is the best available for planning hikes. So far we have found Jake’s map to be very reliable and accurate. Thank you Jake! 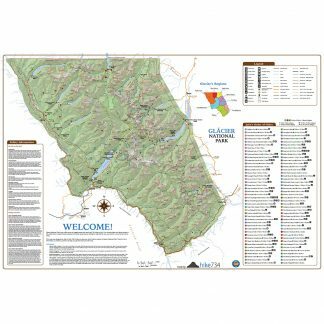 I purchased the wall map for my husband for Christmas!! Glacier is a very special place to us that we fell in love with right away! My husband was so excited to receive it and the special note Jake signed on it to him. It is wonderful to dream about our next hike and to reflect on those we have done!! Feels like a bit of Montana in Illinois! Perfect size to put on the wall! Love the wall map!